Understandably, the subject of death has tended to inspire composers to give of their best, particularly when writing major works such as settings of the Requiem Mass—the solemn liturgy sung in the Roman Catholic Church to honour the departed, to plead for merciful consideration of their sins, and to ask for rest for their immortal souls, (the word ‘requiem’, indeed, is best translated as ‘rest’). There have been many settings of the Requiem text since the Gregorian plainsong version found in the Liber Usualis. Over forty are known to have been written up to the end of the sixteenth century, the most well-known ones being those by Ockeghem (the earliest surviving polyphonic setting, one by Dufay having been lost), Lassus (who wrote two), Palestrina and Victoria, whose 1605 Officium defunctorum is generally considered to be the last, and supreme, setting in the polyphonic style. In the Classical and Romantic periods many hundreds of composers set the text. Mozart, Berlioz, Verdi and Dvorák are perhaps the best known of these but the list also includes J C Bach, Michael Haydn and Leopold Mozart, as well as Cherubini (two, one being for the funeral of Louis XVI), Paisiello, Hasse, Jomelli, Campra, Cimarosa, Meyerbeer, Liszt, Donizetti, Gounod, Saint-Saëns and Bruckner (an early and immature piece). There was even a Requiem written for Mozart by Antonio Rosetti. The best-known settings of the twentieth century are probably those by Duruflé, Ligeti and Frank Martin. The title ‘Requiem’ has also been given to works treating of the subject of death though not in fact settings of the traditional liturgical text. Instances of this are Brahms’s A German Requiem (using passages from the Bible), Britten’s War Requiem (using the traditional text interspersed with the work of English war poets) and Sinfonia da Requiem (written for orchestra), John Foulds’s A World Requiem, Hindemith’s Requiem (with words by Walt Whitman) and, from 1969, John Tavener’s Celtic Requiem (using liturgical texts, Irish poetry and children’s songs, and intended for the stage). The style and personality of a composer, also, seems to focus particularly sharply when writing a Requiem Mass: thus Berlioz’s Grande messe des morts is a remarkable blend of simple, heartfelt tenderness and high romantic drama utilizing vast choral and orchestral forces including four brass bands and a phalanx of percussion; Verdi’s is passionate and fulsome, and has been described as his ‘best opera’. Also of interest is the fact that the personality of composers is often reflected in the passages of text to which they have given particular attention, or even which they have omitted altogether. Thus—to take as examples the two best-known French settings—whereas in Berlioz’s massive work the ‘Dies irae’ (‘Day of Wrath’) is a cataclysmic eruption of choral and orchestral force, in Fauré’s serene masterpiece this lengthy sequence appears not at all as a separate section. Yet another reason, of course, for the high quality of many settings of the Requiem is the fact that they were called into being by the death of someone close to the composer by either blood or temperament. (It is significant that Dvorák’s Requiem, for instance, not written for any particular person or event, is not among that composer’s greatest works). Although a few sketches were made beforehand, most of the Requiem by Gabriel Fauré was composed after the death of his mother on 31 December 1887. Fauré was born on 12 May 1845 at Pamiers, in the département of Ariège in the south of France. At the age of nine he entered the École Niedermeyer in Paris where he trained as a church musician, receiving a thorough grounding in the plainsong and modal harmony which were to become a feature of his mature style. From the piano classes held there by Saint-Saëns he acquired a knowledge of contemporary trends in composition. He graduated in 1866 and became in turn organist of St Sulpice and choirmaster (eventually organist as well) of the church of the Madeleine. In 1896 he was appointed professor of composition at the Paris Conservatoire, but he tired of his career as organist, choirmaster and private teacher and found fulfilment only at the age of sixty when the Conservatoire made him its Director. He died in Paris on 4 November 1924 at the age of seventy-nine. In spite of Poulenc’s waspish dismissal of Fauré’s Requiem as ‘one of the few things I hate in music’, it is indisputably the composer’s most popular work. He began to plan it in 1887 when he jotted down some random ideas in a series of pocket-books. These books reveal that the Requiem was conceived, and the first part of it written down, in C minor—a tone lower than the three separate versions which were eventually completed. There is a rather pedestrian attempt at a ‘Pie Jesu’ in A minor (it returns a little too readily and often to its key-note), but Fauré rejected this in favour of the beautiful melody in B flat major which found its way into all the three versions (1888, 1893, 1900). Among settings of the Requiem Mass, Fauré’s is unique. It does not adhere to the time-honoured liturgical text, and as the composer saw death as a gentle release from earthly life, the horrors of the Day of Judgement are almost disregarded. The ‘Dies irae’, whose torments Verdi represented in the most vivid terms, is reduced to a brief interpolation in the ‘Libera me’ (‘Deliver me, O Lord, from eternal death’), and the work is serene and contemplative, the text purposely chosen to emphasize the word ‘requiem’. 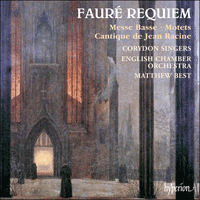 Fauré had no particular reason for writing the Requiem, but while it was in the early stages of composition his mother died, and the first performance, which took place at the Madeleine on 16 January 1888, was a timely memorial. Only five movements were ready: ‘Introit and Kyrie’, ‘Sanctus’, ‘Pie Jesu’, ‘Agnus Dei’ and ‘In paradisum’. The forces required were modest: a mixed choir (with divided tenors and basses), a treble or soprano soloist, and an orchestra comprising lower strings (violas, cellos and double basses), harp, timpani and organ. There is a single violin to play a solo in the ‘Sanctus’, and the organ part is crucial and continuous. In 1889 Fauré completed the ‘Offertoire’ (part of which he later re-used in the ninth of his piano Preludes, opus 103) and revived a ‘Libera me’ originally written twelve years earlier as an independent piece for baritone voice and organ. Horns, trumpets and trombones were added to the orchestra, the horns having a particularly important role in the ‘Libera me’ and an effective fanfare in the ‘Sanctus’. A baritone soloist was now needed for both the added sections, and this seven-movement version was presented, again at the Madeleine, on 21 January 1893. It was not until 12 July 1900 that the third, and final, version of the Requiem was performed at the Trocadéro in Paris, with woodwind added to the orchestra and a full body of violins in the ‘Sanctus’, ‘Agnus Dei’, ‘Libera me’ and ‘In paradisum’. But the extent of Fauré’s involvement in this final version is unclear. The orchestra has become unwieldy and various liberties have been taken with the scoring, possibly by Fauré’s pupil Roger-Ducasse. It is hard to believe that a composer of such fastidious judgement as Fauré would have given it his approval. The 1893 version recorded here would seem the most convincing compromise. The work has been described by Jean Chantavoine as ‘a paradisical imagining with no trace of torment or of doubt, scarcely even of mourning’. Temperamentally, Fauré could not tackle a detailed picture of Hell in a ‘Dies irae’, or portray a terrifying scene of anguish. His primary concern was the beauty of his music. The terrors of the afterlife are hardly more than touched upon, and the untroubled mood of the final ‘In paradisum’ differs from, say, a work like The Dream of Gerontius in the absence of any notion of Purgatory. The music of Fauré’s Requiem evokes comfort, dwelling on the fundamentally good nature present in everything. The Cantique de Jean Racine, dedicated to César Franck, is an early work, dating from 1865. A reticent piece for four-part mixed choir and organ, it won the composer the first prize for composition at the École Niedermeyer, where at that time he was still a student. The Messe Basse (infelicitously named since, strictly speaking, a ‘Low Mass’ is one without music) had an even more complicated birth than the Requiem. It was undertaken in 1881 as a joint endeavour by Fauré and André Messager (the latter best known perhaps for his ballet Les deux pigeons and the opera Madame Chrysanthème). Of the five movements (‘Kyrie’, ‘Gloria’, ‘Sanctus’, ‘O Salutaris’ and ‘Agnus Dei’), three (‘Gloria’, ‘Sanctus’, ‘Agnus Dei’) were by Fauré, the other two by Messager. The setting was for three-part female choir with soloists, accompanied by a harmonium and a solo violin, although shortly after the first performance it was orchestrated, mainly by Messager (Fauré scored the ‘Agnus Dei’). The final version, omitting Messager’s movements but with a new ‘Kyrie’ by Fauré and a ‘Benedictus’ based on part of the now-abandoned ‘Gloria’, was completed in December 1906. In this four-movement version (the one recorded here) the orchestral accompaniment was replaced by an organ. The music, entirely by Fauré, is technically undemanding and has a certain Gallic charm. The two short motets both date from 1894, when Fauré was in charge of the music at the Madeleine and before he took up his professorship at the Conservatoire. The Tantum ergo, for three-part female choir with soloists and organ accompaniment, is one of three settings he made of the text. The Ave verum is a duet for soprano and countertenor (or tenor and baritone) with organ. Both are pleasant enough, if a little simplistic. C’est tout naturellement avec le thème de la mort que les compositeurs ont tendu à donner le meilleur d’eux-mêmes, surtout dans de grandes œuvres comme le requiem—la liturgie solennelle chantée dans l’Église catholique pour honorer les défunts, implorer une considération miséricordieuse de leurs péchés et demander le repos de leur âme immortelle («repos» étant la meilleure traduction du mot «requiem»). Depuis la version grégorienne du Liber Usualis, le texte du Requiem a été maintes fois mis en musique. Les plus célèbres des quarante et quelques requiem écrits jusqu’à la fin du XVIe siècle sont ceux d’Ockeghem (la plus ancienne version polyphonique, de Dufay, ayant été perdue), de Lassus (il en signa deux), de Palestrina et de Victoria, dont l’Officium defunctorum (1605) est généralement considéré comme le dernier, et suprême, requiem de style polyphonique. Aux époques classique et romantique, plusieurs centaines de compositeurs mirent à leur tour ce texte en musique, Mozart, Berlioz, Verdi et Dvoák étant peut-être les noms les plus connus d’une liste où figurent aussi J. C. Bach, Michael Haydn et Leopold Mozart, ou encore Cherubini (l’un de ses deux requiem fut conçu pour les funérailles de Louis XVI), Paisiello, Hasse, Jomelli, Campra, Cimarosa, Meyerbeer, Liszt, Donizetti, Gounod, Saint-Saëns et Bruckner (une œuvre précoce et immature). Il y eut même un requiem écrit pour Mozart par Antonio Rosetti. Les plus célèbres requiem du XXe siècle sont probablement ceux de Duruflé, Ligeti et Frank Martin. Le title de «Requiem» a également été donné à des œuvres traitant du thème de la mort, mais sans mettre en musique le texte liturgique traditionnel. Citons par exemple Un Requiem allemand de Brahms (utilisant des passages de la Bible), le War Requiem (le texte traditionnel est mélangé à l’œuvre de poètes de guerre anglais) et la Sinfonia da Requiem (pour orchestre) de Britten, A World Requiem de John Foulds, le Requiem de Hindemith (sur un texte de Walt Whitman) et, datant de 1969, le Celtic Requiem de John Tavener (destiné à la scène, il mêle textes liturgiques, poésie irlandaise et chansons enfantines). Le style et la personnalité du compositeur semblent également jouer un rôle déterminant dans l’écriture d’une messe de requiem: la Grande messe des morts de Berlioz est ainsi un remarquable amalgame de tendresse naïve, sincère, et de grand drame romantique recourant à de vastes forces choralo-orchestrales (dont des fanfares et une phalange de percussion); Verdi, lui, signa un Requiem passionné et effusif, décrit comme son «meilleur opéra». Notons aussi que la personnalité des compositeurs se reflète souvent dans les passages textuels auxquels ils ont porté une attention particulière, voire dans ceux qu’ils ont complètement omis. Ainsi, pour nous en tenir aux deux plus célèbres requiem français, quand dans l’œuvre massive de Berlioz, le «Dies irae» («Jour de courroux») est une éruption cataclysmique de force chorale et orchestrale, dans le chef-d’œuvre serein de Fauré, cette très longue séquence n’a rien d’une section distincte. Par ailleurs, nombre de requiem tirent leur grande qualité du fait qu’ils furent consécutifs au décès d’un proche du compositeur, que ce fût par le sang ou par le tempérament. (Il n’est ainsi pas indifférent que, n’ayant écrit son Requiem pour rien ni personne en particulier, Dvoák n’ait pas produit l’une de ses plus grandes œuvres.) Même s’il en avait déjà quelques ébauches, Fauré rédigea l’essentiel de son Requiem après la mort de sa mère, le 31 décembre 1887. Né le 12 mai 1845 à Pamiers (Ariège), Fauré intégra à neuf ans l’École Niedermeyer de Paris, où il reçut une formation de musicien d’église, avec de solides bases en plain-chant et en harmonie modale—deux marques du style de sa maturité. Dans les classes de piano tenues par Saint-Saëns, il se familiarisa avec les courants compositionnels contemporains. Diplômé en 1866, il devint tour à tour organiste de Saint-Sulpice et maître de chœur (puis finalement organiste aussi) de la Madeleine. En 1896, il fut nommé professeur de composition au Conservatoire de Paris mais cette carrière d’organiste, de maître de chœur et de professeur particulier le lassa et il ne s’épanouit qu’à soixante ans, quand on le nomma directeur du Conservatoire. Il mourut à Paris le 4 novembre 1924, à l’âge de soixante-dix-neuf ans. Bien que Poulenc l’ait méchamment rejeté («l’une des seules choses que je haïsse en musique», déclara-t-il), le Requiem est incontestablement une des œuvres les plus populaires de Fauré, qui l’envisagea en 1887, jetant quelques idées au hasard dans une série de calepins. Leur lecture nous révèle qu’il fut conçu, et sa première partie notée, en ut mineur—un ton plus bas que celui des trois versions qui seront finalement achevées. Une assez plate tentative de «Pie Jesu» en la mineur (revenant un peu trop volontiers et souvent à sa tonique) vit également le jour, mais Fauré lui préféra la belle mélodie en si bémol majeur présente dans les trois versions (1888, 1893, 1900). La messe de requiem de Fauré est unique: elle n’adhère pas au texte liturgique consacré par l’usage et comme la mort était, pour le compositeur, une paisible délivrance de la vie terrestre, les horreurs du Jour du jugement dernier y sont presque tenues pour quantité négligeable. Le «Dies irae», dont Verdi brossa les tourments dans les terms les plus frappants, se réduit à une brève interpolation dans le «Libera me» («Délivre-moi, Seigneur, de la mort éternelle»), d’où une œuvre sereine et contemplative, au texte choisi à dessein pour mettre en relief le mot «requiem». Fauré n’avait aucune raison particulière d’écrire de Requiem mais, en tout début de rédaction, sa mère mourut et la première exécution, à la Madeleine, le 16 janvier 1888, fut un opportun mémorial. Seuls cinq mouvements étaient prêts («Introït et Kyrie», «Sanctus», «Pie Jesu», «Agnus Dei» et «In paradisum») et les forces requises étaient modestes: un chœur mixte (avec ténors et basses divisés), une voix solo de treble ou de soprano et un orchestre incluant des cordes graves (altos, violoncelles et contrebasses), une harpe, des timbales et un orgue. Il y a un solo de violon dans le «Sanctus» et la partie d’orgue, essentielle, est continue. En 1889, Fauré acheva l’«Offertoire» (qu’il réutilisera en partie dans son Prélude pour piano no9 op. 103) et reprit un «Libera me» vieux de douze ans, un morceau indépendant originellement écrit pour baryton et orgue. Des cors, des trompettes et des trombones furent adjoints à l’orchestre—avec, pour les premiers, un rôle particulièrement important dans le «Libera me» et une impressionnante fanfare dans le «Sanctus». Cette version en sept mouvements, avec ajout d’un baryton pour les deux nouvelles sections, fut présentée, toujours à la Madeleine, le 21 janvier 1893. Ce fut seulement le 12 juillet 1900 que le troisième et dernier état du Requiem fut joué au Trocadéro, avec des bois ajoutés à l’orchestre et un ensemble complet de violons dans le «Sanctus», l’«Agnus Dei», le «Libera me» et l’«In paradisum». On ignore, cependant, dans quelle mesure, au juste, Fauré s’impliqua dans cette mouture. L’orchestre est devenu lourd et on a pris des libertés avec l’instrumentation—on étant peut-être Roger-Ducasse, l’élève de Fauré. Difficile de croire qu’un compositeur aussi exigeant que Fauré eût approuvé cette version. Celle de 1893 enregistrée ici nous apparaît comme le compromis le plus convaincant. Pour Jean Chantavoine, cette œuvre est «une image paradisiaque, sans nulle trace de tourment ni de doute, ni même, presque, de deuil». Son caractère empêchait Fauré de s’atteler à une peinture détaillée de l’Enfer, dans un «Dies irae», ou de brosser une terrifiante scène d’angoisse. Seule le souciait la beauté de sa musique. Les terreurs de la vie après la mort sont tout juste effleurées et, en l’absence de toute notion de purgatoire, la quiétude de l’«In paradisum» final diffère d’une œuvre comme The Dream of Gerontius, par exemple. La musique du Requiem fauréen évoque le réconfort, appuyé sur la nature fondamentalement bonne qui est en toute chose. Le Cantique de Jean Racine, dédié à César Franck, est une œuvre ancienne, datée de 1865. Toute en retenue, pour chœur mixte à quatre parties et orgue, elle valut à Fauré le premier prix de composition à l’École Niedermeyer, où il était encore élève. La Messe Basse (un titre malheureux car une «messe basse» est, à strictement parler, sans musique) eut une genèse encore plus complexe que celle du Requiem. Fauré l’entreprit en 1881 en collaboration avec André Messager (surtout connu, peut-être, pour son ballet Les deux pigeons et pour son opéra Madame Chrysanthème). Des cinq mouvements, trois furent signés de Fauré («Gloria», «Sanctus», «Agnus Dei») et deux de Messager («Kyrie» et «O salutaris»). Le tout fut écrit pour un chœur féminin à trois parties avec solistes, accompagné par un harmonium et un violon solo même si, peu après la création, une orchestration fut menée à bien, surtout par Messager (Fauré, lui, instrumenta l’«Agnus Dei»). La dernière version—sans les mouvements de Messager mais avec un nouveau «Kyrie» de Fauré et un «Benedictus» fondé sur une partie de «Gloria» désormais abandonné—fut achevée en décembre 1906. Dans cette mouture en quatre mouvements (celle enregistrée ici), l’orgue vint remplacer l’accompagnement orchestral. La musique, entièrement de Fauré, est techniquement peu exigeante et dégage un charme bien français. Les deux courts motets datent de 1894, quand Fauré, qui n’était pas encore professeur au Conservatoire, était en charge de la musique à la Madeleine. Le Tantum ergo pour chœur féminin à trois parties avec solistes et accompagnement d’orgue, est l’une des trois versions qu’il fit de ce texte. L’Ave verum est un duo pour soprano et contre-ténor (ou ténor et baryton) avec orgue. Tous deux ne manquent pas de charme, même s’ils sont un peu simplistes. Es leuchtet ein, dass das Thema des Todes die Komponisten stets dazu inspiriert hat, ihr Bestes zu geben, besonders wenn es um große Werke ging wie Vertonungen der Totenmesse—die feierliche Liturgie, die in der katholischen Kirche zu Ehren der Verstorbenen gesungen wird, in der um gnädige Abwägung ihrer Sünden und um Ruhe für ihre unsterblichen Seelen gebeten wird (das Wort „Requiem“ wird tatsächlich am besten mit „Ruhe“ übersetzt). Seit der Version, die als Gregorianischer Choral im Liber Usualis verzeichnet ist, wurde der Text der Totenmesse—oder des Requiems—viele Male vertont. Es ist belegt, dass bis zum Ende des 16. Jahrhunderts mehr als 40 komponiert wurden, von denen die berühmtesten von Ockeghem (die älteste überlieferte polyphone Vertonung von Dufay ist inzwischen verschollen), Lassus (der zwei komponierte), Palestrina und Victoria stammen. Victorias Officium defunctorum von 1605 wird im allgemeinen als die letzte—und als vorzügliche—Vertonung im polyphonen Stil betrachtet. In der Klassik und Romantik vertonten viele hundert Komponisten den Text. Die entsprechenden Werke von Mozart, Berlioz, Verdi und Dvorák sind darunter vielleicht die berühmtesten, doch komponierten auch J. C. Bach, Michael Haydn und Leopold Mozart, sowie Cherubini (zwei, wovon eine anlässlich der Begräbnisfeier Ludwigs XVI. entstand), Paisiello, Hasse, Jomelli, Campra, Cimarosa, Meyerbeer, Liszt, Donizetti, Gounod, Saint-Saëns und Bruckner (ein frühes und unreifes Stück) Vertonungen des Requiem. Es entstand sogar ein Requiem für Mozart von Antonio Rosetti. Die bekanntesten Werke des 20. Jahrhunderts sind wahrscheinlich diejenigen von Duruflé, Ligeti und Frank Martin. Der Titel „Requiem“ ist auch Werken gegeben worden, die zwar das Thema des Todes behandeln, jedoch nicht Vertonungen des traditionellen liturgischen Texts sind. So verhält es sich zum Beispiel mit dem Deutschen Requiem von Brahms (in dem Bibelpassagen verarbeitet sind), mit Brittens War Requiem (in dem der traditionelle Text mit Werken der englischen Kriegsdichter durchsetzt ist) und Sinfonia da Requiem (für Orchester), mit John Foulds World Requiem, Hindemiths Requiem (dessen Text von Walt Whitman stammt) sowie mit John Taveners Celtic Requiem von 1969 (in dem liturgische Texte, irische Dichtung und Kinderlieder vorkommen und das für die Opernbühne gedacht ist). Der Stil und die Persönlichkeit eines Komponisten scheinen auch besonders deutlich hervorzutreten, wenn es um die Komposition eines Requiems geht. Berlioz’ Grande messe des morts ist beispielsweise eine bemerkenswerte Mischung von schlichter, tiefempfundener Zartheit einerseits und hochromantischem Drama mit riesigem Chor- und Orchesterapparat andererseits, in dem vier Blechblasorchester und eine Phalanx von Schlaginstrumenten zum Einsatz kommen. Verdis Requiem ist leidenschaftlich und überschwänglich gehalten und als seine „beste Oper“ beschrieben worden. Ebenfalls interessant dabei ist, dass sich die Persönlichkeit der Komponisten in den Textpassagen widerspiegelt, die sie mit besonderer Sorgfalt vertont oder auch völlig ausgelassen haben. Wenn man die beiden berühmtesten französischen Vertonungen in dieser Hinsicht als Beispiele anführt, so wird offensichtlich, dass in Berlioz’ riesigem Werk das „Dies irae“ („Tag des Zornes“) ein dramatischer Ausbruch der Kraft des Chors und Orchesters ist, während in Faurés heiterem Meisterwerk diese recht lange Passage gar nicht als eigener Abschnitt erscheint. Ein weiterer Grund für die besondere Qualität vieler Requiemsvertonungen ist die Tatsache, dass viele aufgrund des Todes einer Person entstanden, die dem Komponisten entweder aufgrund von Verwandtschaft oder Temperament besonders nahe stand. (Dabei ist es interessant festzustellen, dass zum Beispiel Dvoráks Requiem, das nicht für eine bestimmte Person oder einen besonderen Anlass entstand, nicht zu den größten Werken des Komponisten gehört.) Obwohl er vorher einige Skizzen anfertigte, entstand der Großteil des Requiems von Gabriel Fauré nach dem Tod seiner Mutter am 31. Dezember 1887. Fauré wurde am 12. Mai 1845 in Pamiers, in dem Département von Ariège in Südfrankreich, geboren. Ab dem Alter von neun Jahren besuchte er die École Niedermeyer in Paris, wo er zum Kirchenmusiker ausgebildet wurde und eine solide Grundlage im Cantus planus und der modalen Harmonie vermittelt bekam, was ein Markenzeichen des Stils seiner Reifeperiode werden sollte. In den Klavierklassen, die Saint-Saëns dort gab, eignete er sich Wissen über die zeitgenössischen Trends in der Komposition an. Er machte 1866 seinen Abschluss und wurde zunächst Organist an der Kirche St. Sulpice und dann Chorleiter (und schließlich auch Organist) an der Madeleine-Kirche. 1896 wurde er zum Kompositionsprofessor am Pariser Konservatorium ernannt, gab seine Karriere als Organist, Chorleiter und Privatlehrer jedoch erst auf und fühlte sich ausgefüllt, als er im Alter von 60 Jahren zum Direktor des Konservatoriums ernannt wurde. Er starb am 4. November 1924 in Paris im Alter von 79 Jahren. Trotz Poulencs scharfzüngiger Bemerkung, dass Faurés Requiem eines der wenigen Dinge in der Musik sei, die er hasse, ist es doch zweifellos das populärste Werk des Komponisten. 1887 notierte er erste Skizzen dafür in einer Reihe von Notizbüchern. Diesen Skizzen ist zu entnehmen, dass das Requiem ursprünglich in c-Moll geplant und der erste Teil auch entsprechend notiert wurde—einen Ganzton tiefer als die drei verschiedenen Versionen, die letztendlich fertiggestellt wurden. Es findet sich ein etwas plumper Versuch an einem „Pie Jesu“ in a-Moll (es kehrt etwas zu bereitwillig und oft zu seinem Grundton zurück), doch legte Fauré dies zugunsten der wunderschönen Melodie in B-Dur beiseite, die in allen drei Versionen (1888, 1893 und 1900) erklingt. Unter den Vertonungen der Totenmesse ist Faurés Requiem einzigartig. Er hält sich nicht an den altehrwürdigen liturgischen Text, und da der Komponist den Tod als ein behutsames Sich-Loslösen vom irdischen Leben betrachtete, werden die Schrecken des Jüngsten Gerichts fast ignoriert. Das „Dies irae“, dessen Qualen Verdi in lebhaftester Weise darstellte, wird zu einer kurzen Einschiebung im „Libera me“ („Rette mich Herr, vor dem ewigen Tode“) reduziert und das Werk ist heiter und kontemplativ angelegt, wobei der Text absichtlich so gewählt ist, dass das Wort „Requiem“ betont wird. Es gab für Fauré keinen bestimmten Anlass, das Requiem zu schreiben, doch starb zu Beginn des Entstehungsprozesses seine Mutter, so dass die erste Aufführung, die am 16. Januar 1888 in der Madeleine gegeben wurde, ein passendes Angedenken war. Nur fünf Sätze waren dafür fertiggestellt: das „Introitus und Kyrie“, „Sanctus“, „Pie Jesu“, „Agnus Dei“ und „In paradisum“. Die Besetzung des Werks war recht bescheiden: ein gemischter Chor (mit geteilten Tenören und Bässen), ein Solosopran (entweder eine Knaben- oder eine weibliche Sopranstimme) und ein Orchester, das aus tiefen Streichern (Bratschen, Violoncelli und Kontrabässe), Harfe, Pauke und Orgel bestand. Zudem hat eine einzelne Violine ein Solo im „Sanctus“; die Orgelstimme ist besonders wichtig und durchgehend eingesetzt. 1889 stellte Fauré das „Offertoire“ fertig (das er später teilweise in dem neunten seiner Préludes für Klavier, op. 103, wiederverwendete) und griff ein „Libera me“ auf, das er ursprünglich zwölf Jahre zuvor als ein eigenständiges Stück für Baritonstimme und Orgel komponiert hatte. Dem Orchester wurden Hörner, Trompeten und Posaunen hinzugefügt, wobei die Hörner im „Libera me“ eine besonders wichtige Rolle spielen und im „Sanctus“ eine wirkungsvolle Fanfare haben. Für die beiden neuen Teile wurde nun auch ein Solobariton benötigt und diese siebensätzige Version wurde, wiederum in der Madeleine, am 21. Januar 1893 uraufgeführt. Die dritte und letzte Version des Requiems wurde erst am 12. Juli 1900 im Trocadéro in Paris aufgeführt, wobei dem Orchester Holzbläser und ein vollständiger Geigenapparat im „Sanctus“, „Agnus Dei“, „Libera me“ und „In paradisum“ hinzugefügt worden waren. Es ist jedoch unklar, inwieweit Fauré diese endgültige Version selbst komponiert hatte. Das Orchester ist etwas schwerfällig geworden und in der Besetzung hat sich jemand, möglicherweise der Fauré-Schüler Roger-Ducasse, mehrere Freiheiten erlaubt. Es scheint nicht plausibel, dass ein penibler Komponist wie Fauré dem seine Zustimmung gegeben hätte. Die Version von 1893, die hier vorliegt, scheint demnach der überzeugendste Kompromiss zu sein. Das Werk ist von Jean Chantavoine als „eine paradiesische Vorstellung ohne jede Spur der Qual, des Zweifels und sogar kaum der Trauer“ beschrieben worden. Fauré war aufgrund seines Temperaments nicht in der Lage, ein genaues Bild der Hölle in einem „Dies irae“ zu entwerfen, oder eine furchteinflößende Szene des Schmerzes darzustellen. Sein Hauptanliegen war die Schönheit seiner Musik. Die Schrecken des Lebens nach dem Tod werden kaum erwähnt und die ungetrübte Stimmung des letzten Satzes „In paradisum“ unterscheidet sich von einem Werk wie etwa The Dream of Gerontius durch die Abwesenheit jeglicher Andeutungen auf das Fegefeuer. Die Musik von Faurés Requiem stellt Behaglichkeit dar und verweilt bei der grundsätzlich gutartigen Natur, die in allen Dingen vorhanden ist. Der Cantique de Jean Racine, ein Frühwerk, das 1865 entstand, ist César Franck gewidmet. Es ist dies ein zurückhaltendes Stück für vierstimmigen gemischten Chor und Orgel, mit dem der Komponist den ersten Preis für Komposition an der École Niedermeyer gewann, an der er zu dem Zeitpunkt noch Student war. Die Entstehung der Messe Basse (deren Namensgebung etwas unglücklich ist, da es sich dabei strenggenommen um eine stille Messe, also ohne Musik, handelt) war noch komplizierter als die des Requiems. Es handelt sich dabei um ein Gemeinschaftswerk von Fauré und André Messager (der vielleicht für sein Ballett Les deux pigeons und die Oper Madame Chrysanthème am meisten bekannt ist), das 1881 unternommen wurde. Von den fünf Sätzen („Kyrie“, „Gloria“, „Sanctus“, „O salutaris“ und „Agnus Dei“) stammten drei von Fauré (das „Gloria“, „Sanctus“ und „Agnus Dei“) und die restlichen beiden von Messager. Die Vertonung war für dreistimmigen Frauenchor mit Soli und Begleitung durch ein Harmonium und eine Solovioline angelegt, doch wurde das Werk kurz nach der ersten Aufführung—hauptsächlich von Messager (Fauré übernahm das „Agnus Dei“)—orchestriert. Die endgültige Version, in der Messagers Sätze ausgelassen und dafür ein neues „Kyrie“ von Fauré und ein „Benedictus“, das auf einem Teil des nun ausgesparten „Gloria“ fußt, eingefügt sind, wurde im Dezember 1906 fertiggestellt. In dieser (hier vorliegenden) viersätzigen Version wurde die Orchesterbegleitung durch eine Orgel ersetzt. Die Musik, die vollständig von Fauré stammt, ist technisch nicht anspruchsvoll und besitzt einen gewissen gallischen Charme. Die beiden kurzen Motetten stammen aus dem Jahr 1894, als Fauré für die Musik an der Madeleine zuständig war und bevor er seine Professur am Konservatorium antrat. Das Tantum ergo für dreistimmigen Frauenchor mit Soli und Orgelbegleitung ist eine von drei Vertonungen, die er für diesen Text anfertigte. Das Ave verum ist ein Duett für Sopran und Alt (oder Tenor und Bariton) mit Orgel. Beide sind gefällig, wenn auch etwas simpel gehalten.